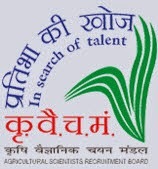 The Agricultural Scientist Recruitment Board (ASRB) will hold an open Competitive Examination to the post of Assistant in the Pay Band ( PB ) – II : 9300 – 34800/- + Grade Pay (GP) of 4600 at ICAR Headquarters (ICAR Hqrs. ), New Delhi and 4200 at ICAR Research Institutes. The Preliminary Examination will be followed by a Main Examination for those who will qualify in the Preliminary Examination. The Preliminary Examination will be conducted by on-line mode. Final merit list of successful candidates will be released only after the result of the Main Examination is announced and will be based on the marks obtained in the Main Examination only. Education Qualification: Candidate must be a Graduate from a recognized University. Age(as on 29.09.2014) : 20-27 years. Application Fee: Rs. 1000 for UR/OBC. www.asrb.org.in can only be used for the purpose. Please note that Online Application Form and pre-printed system generated SYNDICATE Bank Challan available on the said website only will be valid.